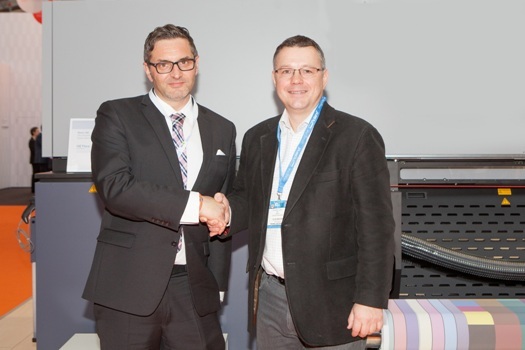 Company signs deal for New Rho 512R system at FESPA Digital. UK based Leach, a major supplier to the world of high-impact, large-format graphic displays, has signed a deal at FESPA Digital with Durst UK for a new Rho 512R system. Now in its 125th year of operation, the company creates graphic displays and display structures as a complete project management specialist to blue chip companies such as HSBC, Gap, Arcadia, Vauxhall, Jaeger, and BMW to name but a few. The new Durst Rho 512R is scheduled for installation at the end of May where it will join three existing Durst UV printers at the company’s headquarters in Huddersfield, West Yorkshire. Leach has now invested a total of around £4million in Durst systems in a partnership stretching over 20 years, but this is the first 5m wide model. “The Durst Rho 512R provides outstanding print quality at this size format,” said Managing Director Richard Leach. “We’re buying it to support our growth in the large-format fabric graphic market, where we’ve developed our own range of LED-illuminated lightboxes. “The major brands and retailers are demanding bigger and bigger size formats for their flagship stores and events. These customers need us to supply outstanding quality printing in a quick and responsive manner, often including installation and project management. Our success in consistently delivering this integrated package is a major driver of our growth, which is running at around 25 per cent in this sector over the last 12 months.